While I wouldn’t exactly say that my thumbs are black, they certainly are not green–in other words, I’m not real good at growing stuff. The only plant I’ve managed to keep alive for more than a year or two is either a golden pathos or a philodenrum (not sure which) that I was given in Miami, Okla. seven years ago. Given that knowledge, it might seem odd that I was so incredibly excited to start John and my’s first garden this year. Our landlord not only said we could dig a garden, but he encouraged us to do so. I think for me it was something that John and I both wanted, and it was the idea of doing something fun, productive and earthy with my new husband that got me so excited about the idea of our first garden. I started bugging John about this project probably more than a month ago, but we didn’t start really discussing it until last month. There were lots of decisions to make: where would we put the garden? What would we plant? What kind of garden would we create? After much discussion, research and well, trips into the land of reality, we realized that the best route for us is what most might not even consider a “true” garden. 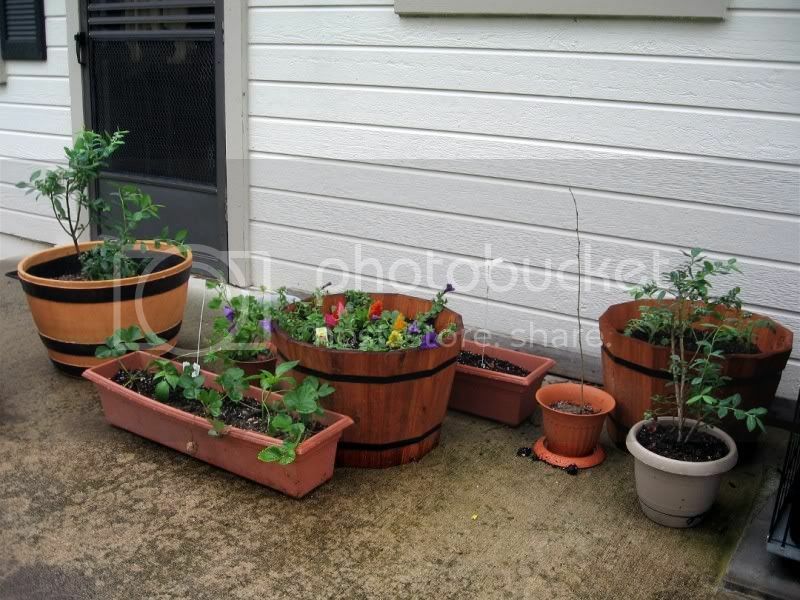 We created a container garden, which means our entire garden is in pots, planters and other containers. We first were going to dig a traditional garden but the lack of desire to till the land got rid of that idea pretty darn quick. Then we talked about a raised bed garden and we considered the different means of creating the garden, including if we would make the kind that we could eventually tear down and take with us, or if we would create something for future tenants of our apartment to tend. The idea of leaving something for future tenants to feel obligated to take care of was actually a concern for both the in-ground garden and the raised garden beds. After looking at our options and our budget, we decided on the containers. The containers were ultimately cheaper, will be MUCH easier to care for (especially for me considering the wheelchair access issue) and they will be something that we can take with us instead of us investing all this money for a summer or two of gardening. 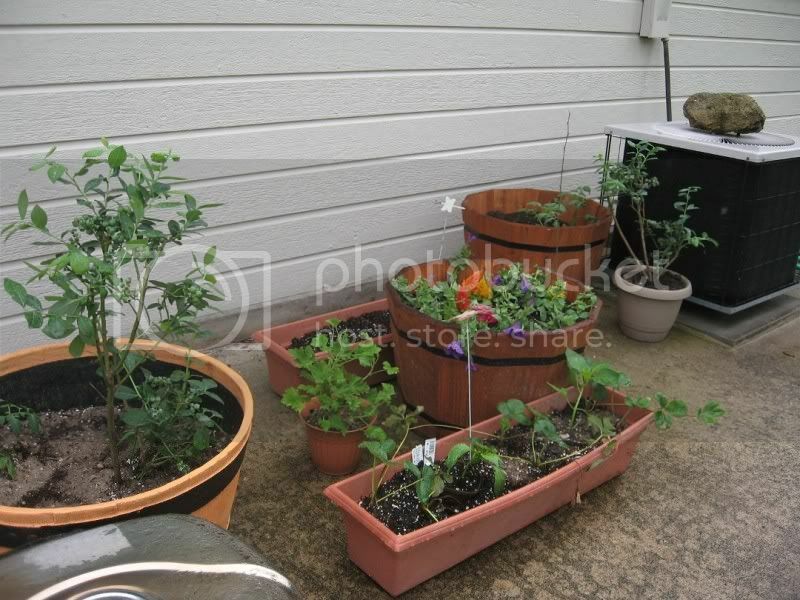 Another added bonus of container gardening is we can move the containers in and out of sunlight, rain, etc. to meet the needs of what we planted. Anyways, so this last Saturday we headed off to Lowes with a pretty good idea in mind of what we wanted. We had to buy everything from scratch including the containers, the soil and of course the plants. We did a mixture of seeds and plants, which varied based on what we were planting. Here was the interesting catch with all of this process: Saturday was pretty chilly at about 55 degrees and it was rainy. Not really a good day to plant a garden, eh? Not so with container gardening! We planted our entire garden in our living room. It was a little nutty, but that made it even more fun! I should probably add that we already had some planters and equipment. I had a few pots and two window planters that I had at my old apartment. All got used! 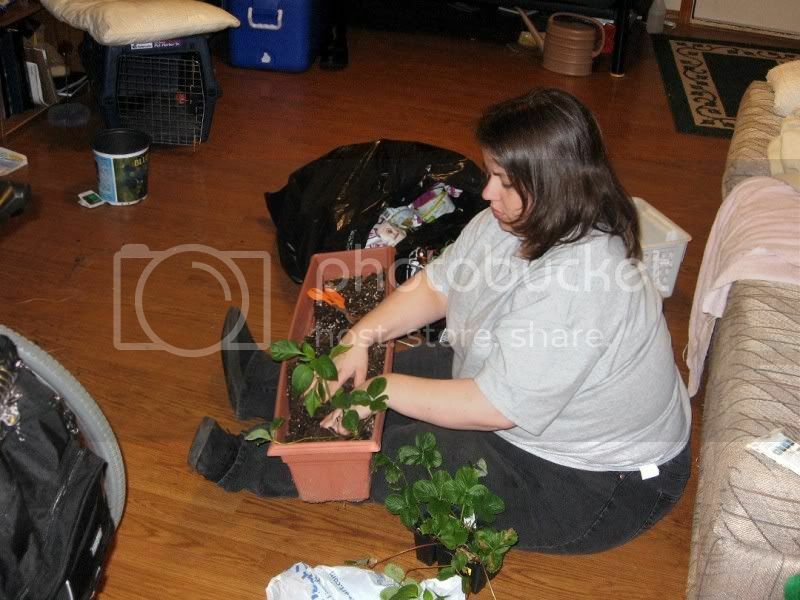 Here I am planting alternating plants of bell peppers and strawberries in the old planters. The only containers really that we had to purchase were the three large (20-inch) containers that are made to look like half whiskey barrels. This was a look John and I both really liked and our families had used something with a similar look when we were kids. The decision to get those kinds of containers were both practical because of their size and nostalgic because of the history. 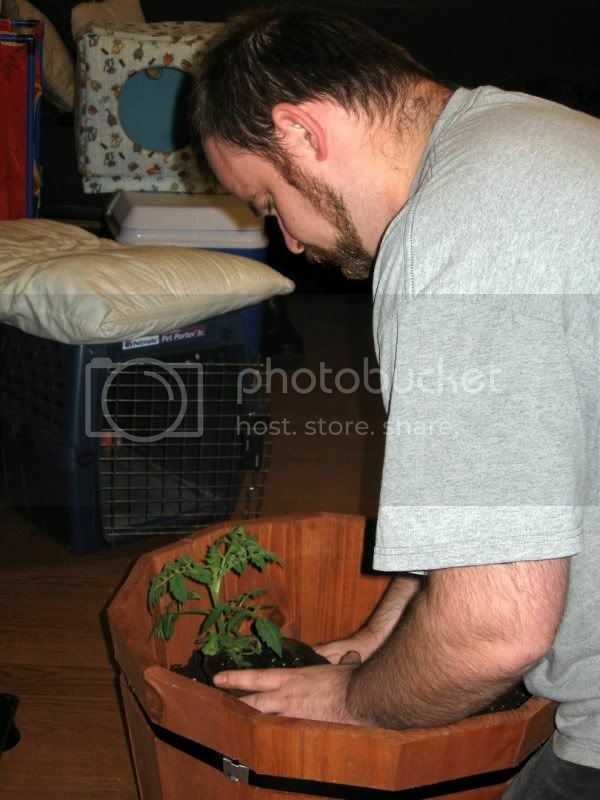 Here’s John carefully planting a tomato plant in one of the planters. 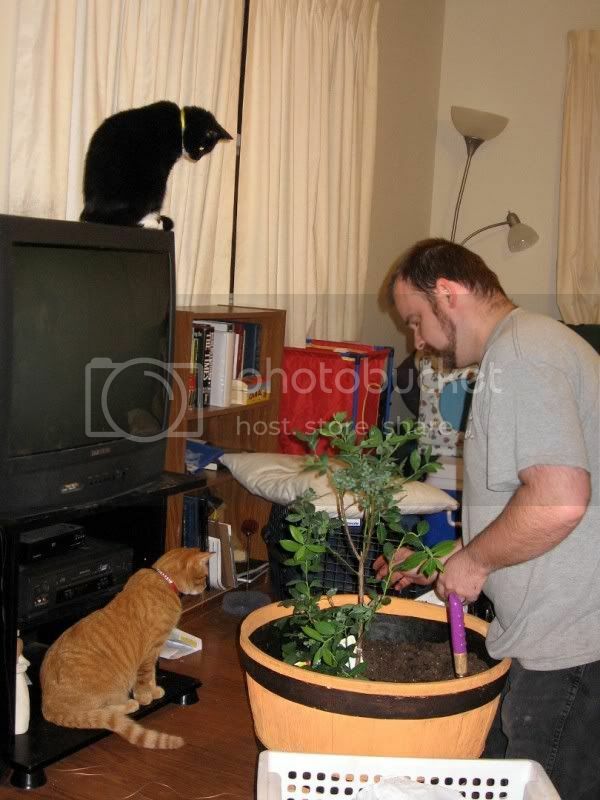 And of course as we did all this, the cats kept careful watch! The only thing we ended up not fitting into any of the containers was the corn, which John is going to plant along the back porch, I believe in a row. We also had some plants that were inside for the winter or that we had received recently that are now on the back porch. We also bought a Dracaena marginata tree for inside, but I don’t have any photos of that yet. These trees are also apparently called red-edge Dracaena or the Madagascar dragon tree. Wow ! 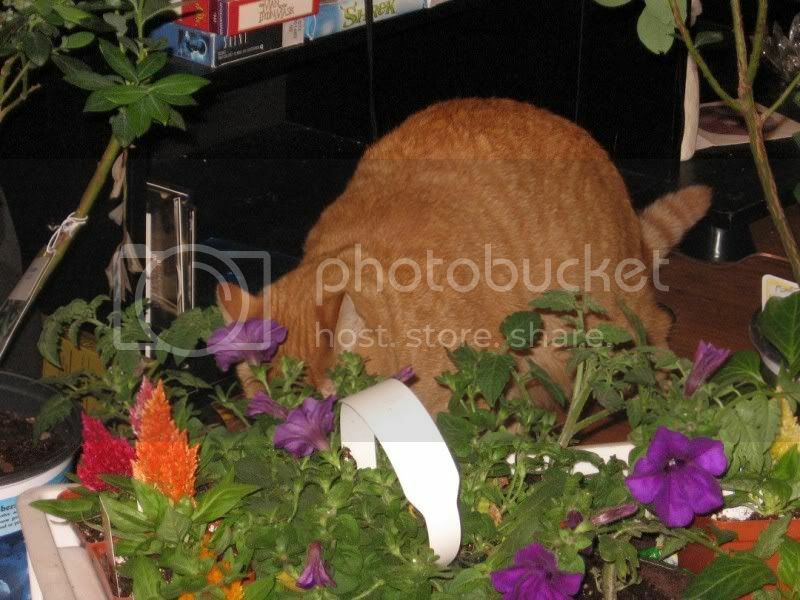 I love to look at those green leaves as well as those pretty kittens you have. It seems like you have inspired me to do green myself. LOL. Anyways, you have mentioned to your blog that you had been a consumer of Lowes yourself. I was wondering if you might want to check out this site i have found where you can post comments and reviews about certain companies like Lowes. 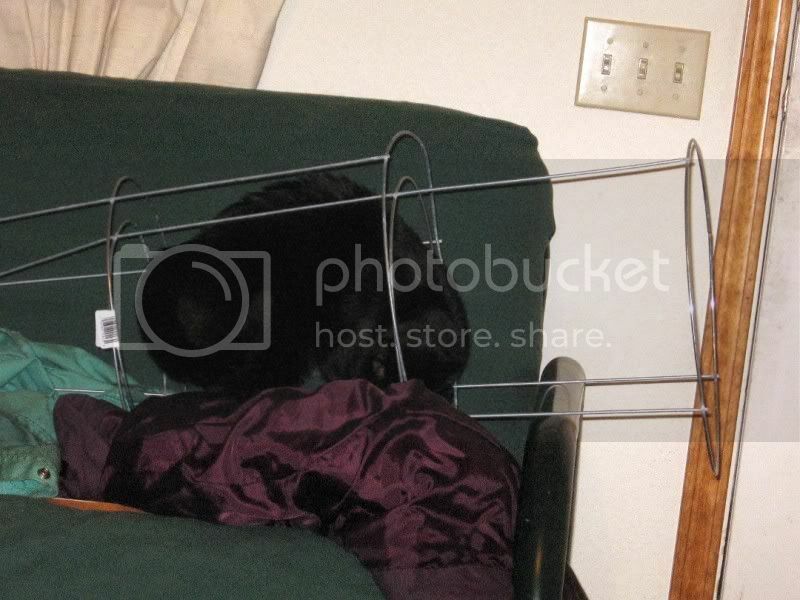 Hopefully, you might find it resourceful and interesting as much as i do.